The first 15,000 people get a free Swiffer Duster. Also, 50 lucky winners will each receive a Swiffer Wet Jet Starter Kit, a Swiffer Sweeper Starter Kit and a Swiffer Extendable Handle Starter Kit. Filled out form and it says “One Moment Please” for the last 5 minutes… not sure what’s going on!!! oh, i so need the duster for my ceiling fans. thank you. I Look forward to trying out the Swifter Duster. soooo it says “THANK YOU FOR ENTERING THE SWEEPSTAKES! WHAT DOES THAT MEAN DID I GET A SWIFFER??? 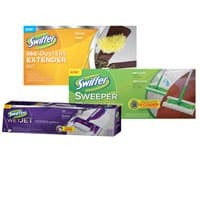 I love Swifter Products. I have a small cleaning company & my customers love the smell of their clean house! I do like all Swiffer products. They make cleaning easier. what the heck now im gonna get billed cause i did what you said! Tells me to leave a country shipping code but there is no where to add one or tell you what it is. So much for this.